Sought for their exceptional quality, the Royal Mint’s Gold Maple Leaf and Silver Maple Leaf bullion coins also boast several unique security features. The traditional bullion finish has been replaced with radial lines, precisely machined to within microns. The uniqueness of the line width and pitch create a light-diffracting pattern specific to each coin. Each bullion coin features a textured maple leaf that is micro-engraved with laser technology to be visible only under magnification. Etched within this maple leaf are two digits indicating the coin’s production year. This proprietary technology jointly developed by the Royal Canadian Mint and Arjo Solutions includes the patented Signoptic® technology to facilitate the authentication of Gold Maple Leaf coins dated 2014 and later, and Silver Maple Leaf coins dated 2015 and later. Each coin’s security mark can be match to the Royal Canadian Mint database, giving investors greater peace of mind. White spots on silver bullion coins have been a known issue in the global bullion market for years. While white spots do not change the purity or composition of bullion coins, investors have expressed concern about their impact on the coins’ aesthetic quality. The Royal Canadian Mint’s proprietary Mintshield technology significantly reduces the occurrence of white spots or “milk spots” that compromise the aesthetic quality of silver bullion coins. White spotting is not like tarnishing or other oxidation phenomena. Its appearance is unpredictable and irregular. The engineering team at the Royal Canadian Mint knew that their first order of business was to identify the root cause of the spots. Collaborating with a local Canadian university, the Mint’s research concluded that there is no single cause of white spots. Multiple factors have an impact, including the way silver reacts with contaminants in processing, handling and storage. Once the Mint believed it had identified a way to reduce white spots, testing began on a small batch of coins and was expanded to a production scale experiment. Accelerated testing confirmed the surface protection solution would significantly reduce the appearance for white spots for years. 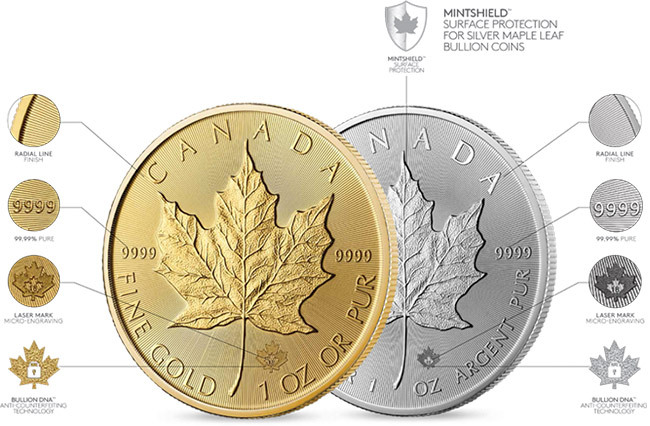 Without changing the composition or purity of the coin, and invisible to the eye, Mintshield provides surface protection for Silver Maple Leaf bullion coins dated 2018 or later.